Jet Pulverizer Co. has expanded service offerings with our new ISO 8 classified processing suite for micronizing Pharmaceuticals, Nutraceuticals and Foodstuffs. Various processing services are available such as micronization via spiral jet mills, hammer milling and screening at cGMP level protocols. 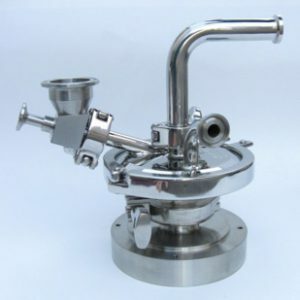 Jet Pulverizer is capable of safely handling low-potent APIs, excipients and intermediates. 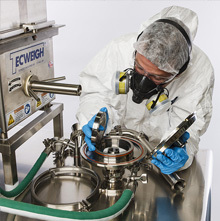 Flexible isolation options allow for inert grinding and enhanced containment when necessary. ISO 8 (Class 100,000) classified area that features down draft ventilation, temperature & humidity controls, positive pressure airlocks, and an isolated gowning room. Resources include Type III DI water for washdown and cleaning equipment, desiccant & HEPA filtered compressed air, carbon filtered & molecular sieve compressed nitrogen, and high purity (99.998%) liquid nitrogen for low temperature milling. Jet Pulverizer has developed proprietary procedures for cryogenic milling in our ISO 8 area. If you need to mill plastics pellets to < 1 mm for your small pharma extruder, while maintaining GMP conditions, we can help. GMP materials are secured in our dedicated and environmentally controlled storage area.